It's been a foot on the pedal kind of week, with a flurry of fabric arrivals, cutting, sewing, basting, quilting and finally binding. Those strawberries are so darn cute! I was lucky enough to snap up a Fat Quarter bundle of Briar Rose by Heather Ross - an early release from Quilt Market and was so excited to get my hands on it that I cut into it the same day it arrived on my doorstep. 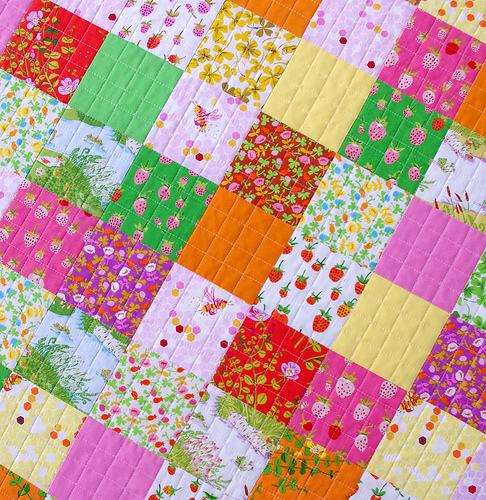 I have made a simple patchwork quilt using all of the prints from the Briar Rose Collection and have teamed them with a number of matching solid fabrics. For the back of the quilt I have used a small blue and green dot on a white background (from The Simple Life by Tasha Noel) which complements the colors of the Briar Rose collection and I have quilted the quilt with an all over 1 inch grid. Although more heavily quilted than most of my previous quilt, the quilt feels light and drapes beautifully. The quilting texture simply demands to be touched. For binding I have used an irregular soft pink/white stripe (Straws in Pink - Simpatico by Michelle Engel Benckso). I have updated my Etsy Store. 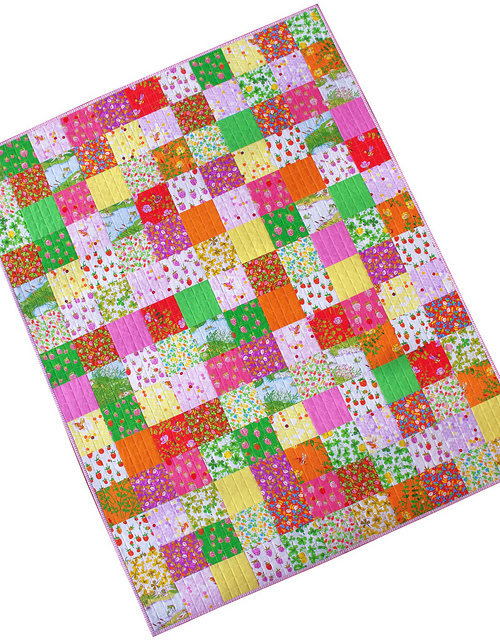 You can see the listing details for this quilt here: Modern Patchwork Quilt. There's going to be one lucky girl! Thank you for stopping by and have a great weekend. Ours is a long weekend! That is beautiful! Yours always look so perfect and flat! Yes, long weekend! hooray! It's so pretty, well done! I love how you stitched it all together! Could I ask what method you use to get the quilting lines the perfect distance apart? Is there an attachment for your sewing machine foot or do you draw the lines on first? 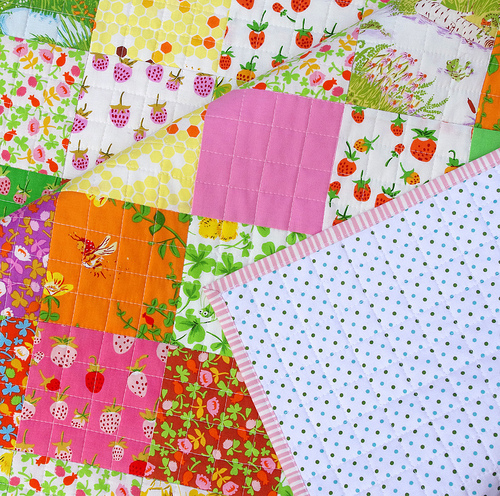 Your Briar Rose quilt is adorable. 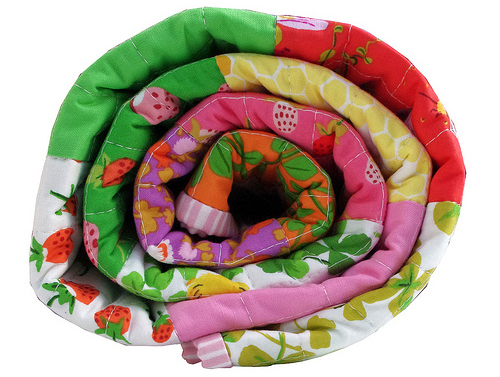 Such pretty fabric, great quilting, and another pretty backing. Well done! What a sweet quilt. Indeed a lucky girl! I was just thinking that a bit more blue would make it perfect and then I saw the back... yours always come out beautifully! Love! 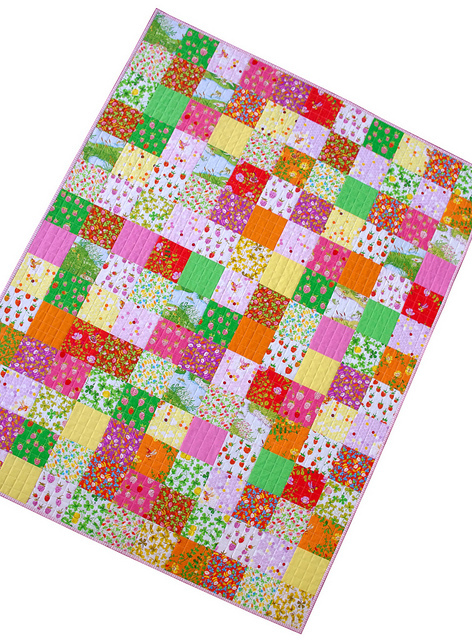 off to convince the girl she needs a quilt like this! Oh, I love this quilt! so bright and cheerful ~ it would be great for the winter when it's cold and dreary ~ a reminder of the spring! Such a pretty, happy quilt. I am so looking forward to this line! You have such an amazing eye for fabric coordination. Beautiful, as always. And your photography skills are excellent!! Love, love the bright colors. 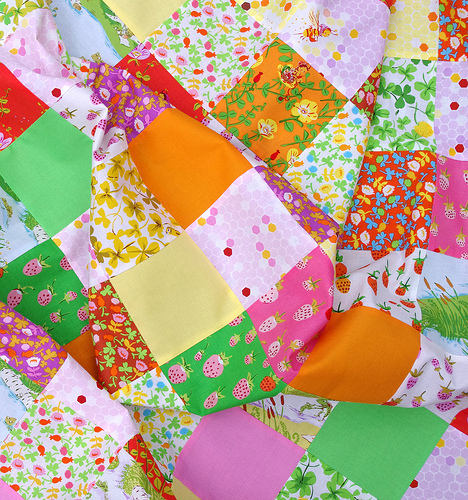 Nothing more fun than a simple patchwork quilt. So much history in that type of piecing. You have inspired me! 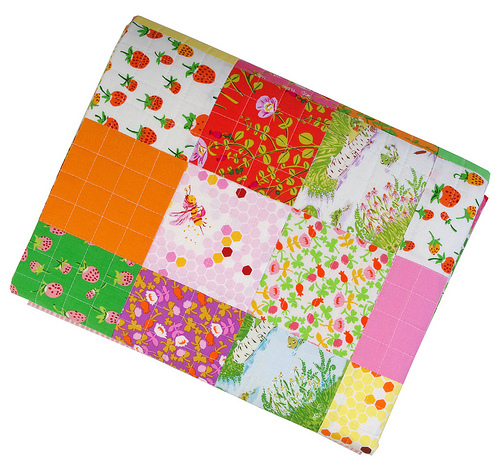 What a bright and cheery quilt. As always, I love your choice of binding. 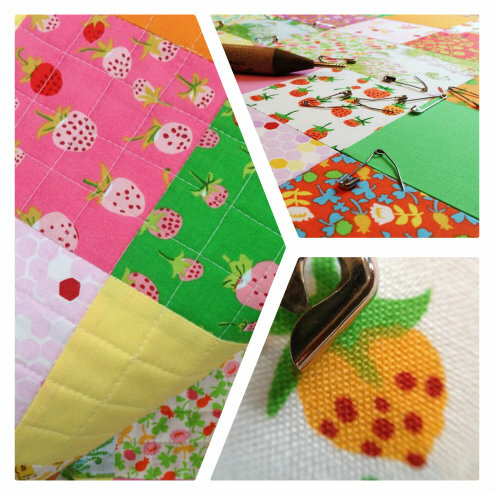 The 1" quilting grid is a bit daunting (no wonder you had a pedal to the metal week!!) --but it looks fantastic. What a beauty!!!!!!!!!!!!!!!!!!! Have a great long weekend! Beautiful! What batting do you use? Hi Kitty - thank you for your comment. 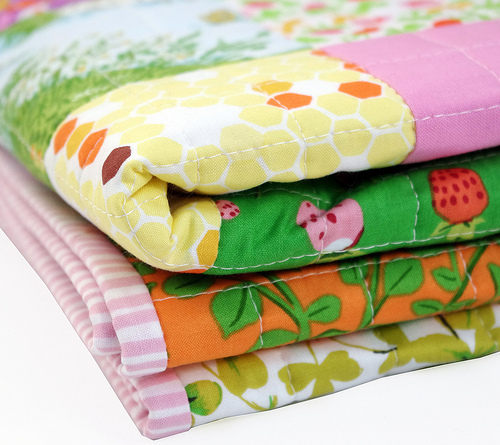 I use 100% cotton batting which is low loft and allows the quilt to drape beautifully. The colors are pretty yummy! I am pre-ordering mine now! The strawberries are my favourite. Long weekend here in Melbourne, too. Wonderful opportunity for a bit of extra sewing.